One of the delights of teaching courses encouraging others to write blogs is that – without exception – the participants always come up with interesting stories and here are just a few recent examples. 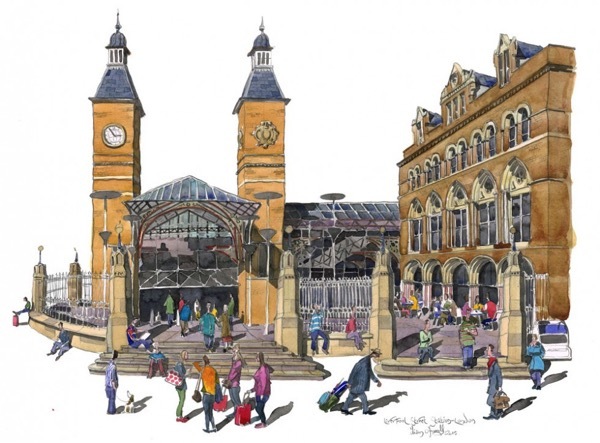 The next course HOW TO WRITE A BLOG THAT PEOPLE WILL WANT TO READ will be held in Spitalfields on 7th & 8th November. Email spitalfieldslife@gmail.com to book your place. Some years after my father died, my mother came across a handful of old snapshots in a battered leather wallet. One of the pictures fascinated me in particular. It was the only hand-coloured image in the collection and showed five boys under a tree, relaxed and grinning at an unknown photographer with long, pointed sticks in their hands. 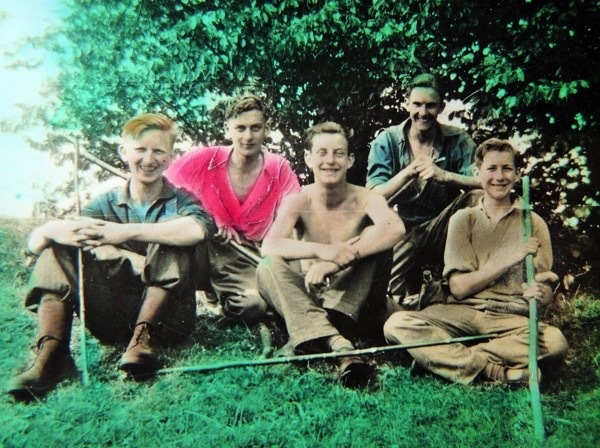 On the reverse was written in faded blue ink, “Expedition to East Coker Woods, Whit Monday 1944.” It was not difficult to locate my father (on the far right) and my future uncle through marriage behind him. “But wasn’t the place he went to called Yeovil – not East Coker?” I asked. When I was a child, my father occasionally told me stories about the time he had spent in Somerset during the war. He told me about collecting newts in jam jars, about raiding birds’ nests for eggs and hunting for shrapnel in the lanes. When I grew older, he added other tales to his repertoire – the dances in the village hall, drinking scrumpy straight from the barrel and shooting rabbits. When I asked my father where this village was, all he said was that it was called ‘Yeovil.’ The place sounded exactly the mythic English village of perpetual idyllic summers, where hollyhocks and sunflowers towered high, and children were free to run through woods and fields. I pulled out an old AA drivers’ map and once I located Yeovil it was easy to find East, West and North Coker. I thought it strange that my father, who loved poetry, had never bothered to tell me about the village and the connection to TS Eliot and his Four Quartets, particularly when I had studied the writer so intensively for my exams. 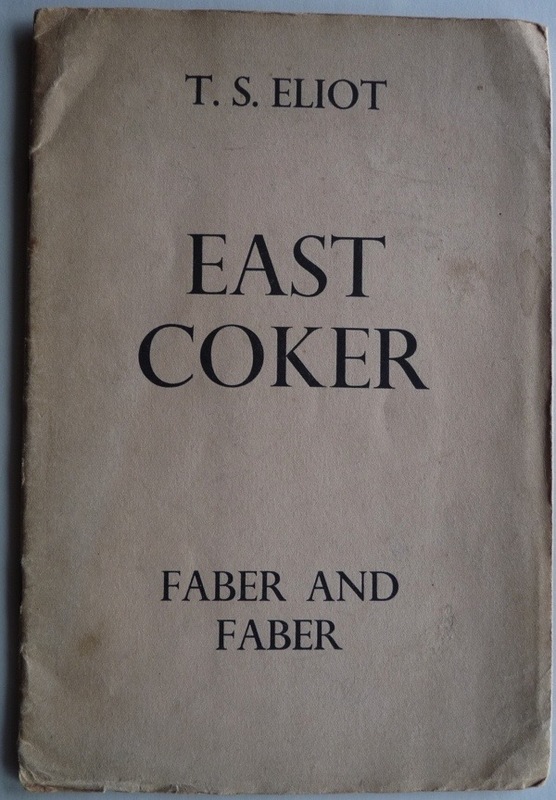 As we were growing up, my father had given my sister and me an eclectic mix of poetry books and he must have been aware of the connection Eliot had with East Coker. It was as if he had never wanted us to know the exact location of the village which had taken away so much with one hand – his home in London and his coveted scholarship to the posh school in Dulwich – but which had bestowed gifts with the other – love and respect for nature, and an appreciation and understanding of the countryside. A few weeks later I came across the East Coker Newsletter online, proclaiming that there would be special events to commemorate the anniversary of VE and VJ Day during the second weekend in July, and I knew I had to make the trip. From Yeovil we caught a bus to East Coker, travelling the same route the evacuees came on September 1st, 1939. 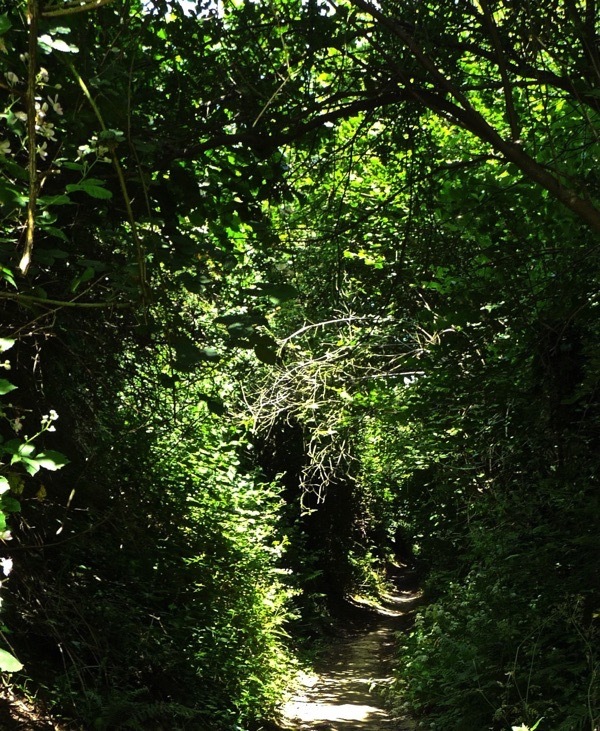 Before long, a cast-iron signpost pointed us in the direction of East Coker and the bus veered off down a narrow lane which sunk deeper as we travelled along it. Roots of ancient trees protruded from the sandy soil, while above us their canopy shut out the late afternoon sun. We rounded an unexpected corner and came into the centre of East Coker – a village that looked as if it should not belong in the twenty-first century. Walking across the damp fields at dusk towards the warm light of the pub on that first evening, it was almost possible to imagine that, in this place, the past might still exist in some ghostly form alongside the present. In the heat of the following day, on a sunken footpath which led from the farm through the woods to the old priory, I lay down, head to the red soil, and heard the drum of distant hooves and the click of midsummer insects. For those few seconds, it felt as if the earth was struggling to gather up momentum to move backwards, to reveal something to me – until the shouts of children in the playing fields broke through the thick afternoon air. The following day I met the boy who had taken the photograph in the woods on Whitsun Monday over sixty years previously. He was manning one of the stalls at the village hall war exhibition and his table was a jumble of World War II paraphernalia – old ration books, home guard uniforms and pieces of ammunition. One part of his collection was dedicated to the story of the friendship between local children and the evacuees. And there I saw it – among the letters and diaries and printed memorabilia, was a copy of my own photograph in black and white, mounted in a crude wooden frame. Not trusting myself to speak, I reached into my bag and pulled out my hand-coloured version, and passed it across the table, watching the old man’s face as he struggled to work out the connection. It was then I learnt about that day out in the woods. A moment of late childhood, hanging high and free above the dark shadow cast by the war, and caught on camera like a dragonfly in ether for future generations to see. 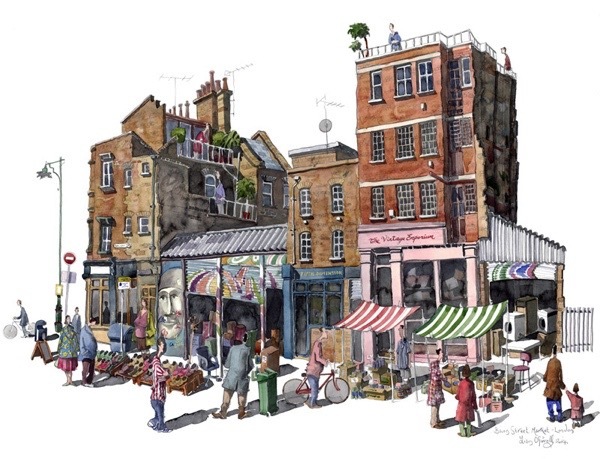 I love painting markets, so when I was commissioned by a couple to paint Spitalfields Market, I jumped at the chance. 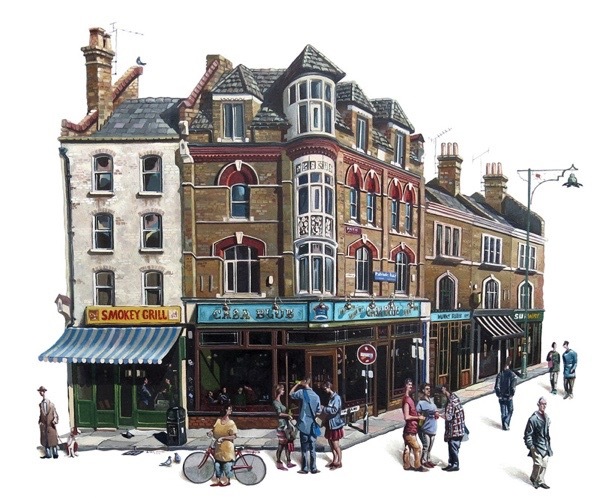 The clients’ family had worked in the market way back as far as the nineteenth century but they wanted the painting to be set in its heyday in the nineteen-thirties and include an old photo of his family at their market stall. 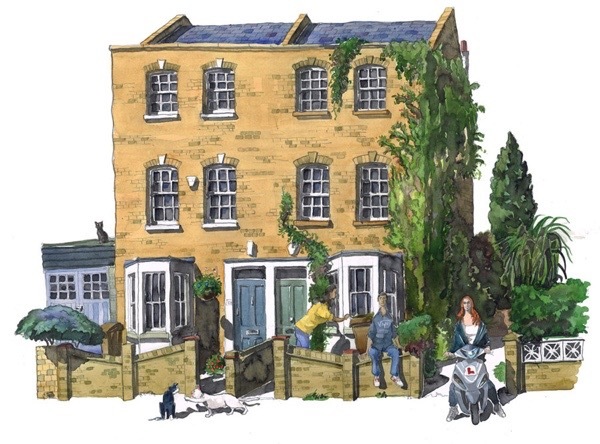 I lived in Hackney for a few years and enjoyed my time there, so I was delighted to revisit the borough to paint one of the typical terraced houses around London Fields. 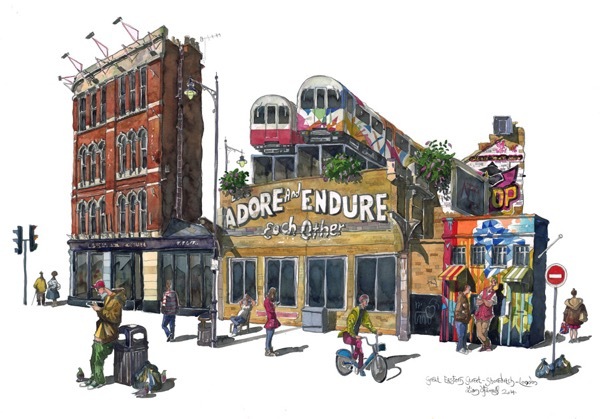 In my time, Hackney was viewed as run down and more than a little bit lawless. Dear Readers, at this time of year a walk through my garden involves pushing through at least one spider’s web strung at head height. I feel bad as the remains float off the breeze like so many silk curtains, but what can I do? The spiders are everywhere. They have been here since spring but they have been tiny. Most European spiders moult their skins five to ten times in their lives, growing larger after each episode, and in these late golden days, we start to notice the creatures for the first time. 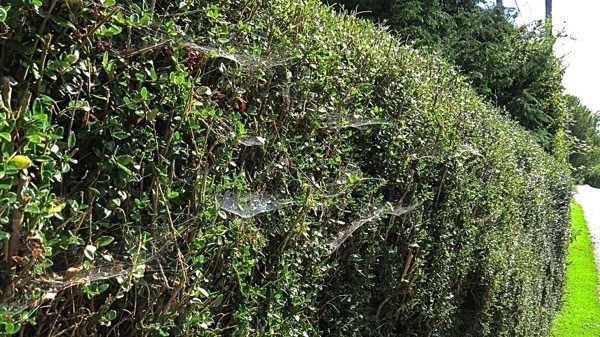 On a misty October morning, it may feel as if a hedge is more web than foliage. Webs will vary according to the age and experience of the spider. With practice, you can determine the style of an individual spider. It is too easy to think of small creatures as identical automata but there is great variation in ‘character’ even among animals that we have been taught to consider almost brainless. Silk is not just for webs, however. Spiders use it in almost every aspect of their lives. Spiderlings use an especially fine kind of silk known as gossamer in order to disperse. Once launched, the little spiders have no control over where they go. They may get eaten by swallows, fall into water or become food for other spiders. Nonetheless, this literal leap into the unknown resembles what many young humans have been doing at this season, as they start school or leave home to go to college. Spiders’ silk is a form of protein, which is produced within the spiders’ body in the form of strands and exuded by the spinnerets, two glands at the base of the abdomen. Whilst many invertebrates produce silk, it has reached its highest form in the spider and one can produce up to seven kinds of silk. We often hear that spider silk is as strong as steel, but what is truly remarkable is its toughness. Toughness is the measure of how hard it is to break a filament and silk used for supporting a web is tougher than any man-made substance. Darwin’s Bark Spider produces the toughest silk of all, which has been estimated to be ten times as tough as kevlar. It can build webs with strands of up to twenty-five metres across rivers. I imagine walking into a web like this would be like walking into a cheese wire. 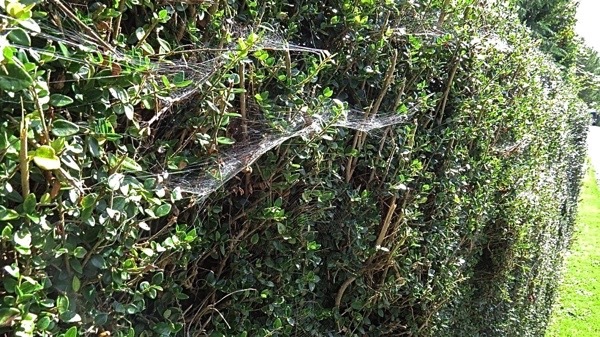 The thing that I love about spiders’ webs is their combination of strength and delicacy, yet they often go unnoticed until a foggy morning reveals that every inch of a box hedge is connected with a lace-like lattice of silk, as beautiful and tattered as Miss Haversham’s wedding dress. 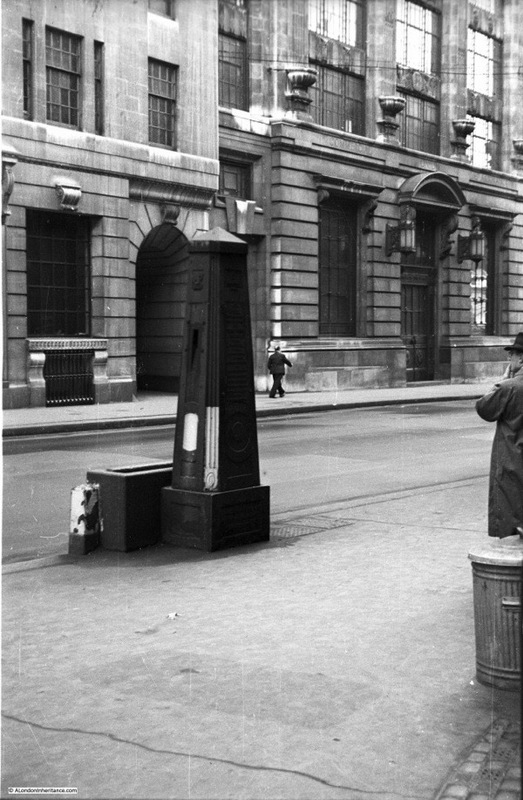 My father took the photo of the Cornhill Water Pump in 1948 and what surprised me as I was taking the photo of it today is how little has changed. Not just the stonework of the buildings opposite which have been cleaned in the intervening years, but also the windows, the large lamps either side of the door on the right and the stone decoration on both buildings are the same. Apart from the traffic and the post box, I see little change. During construction of Lloyds Bank there in 1927, the roadway and several buildings in Cornhill collapsed. The damage was so bad that the Commercial Union building had to be rebuilt and it is that building we see today on the right of the photograph. The collapse was put down to loose soil where the Walbrook once flowed beneath this part of the City at the approximate position of the water pump. 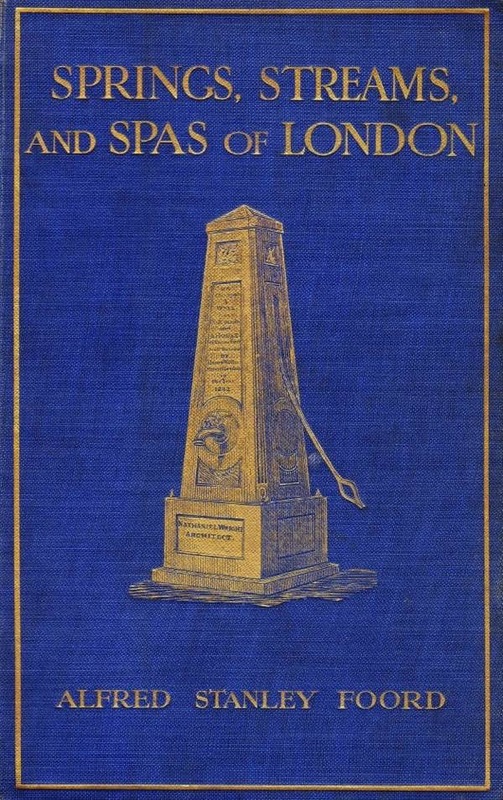 Writing in 1910, Sir Walter Besant refers to the origin of the pump in ‘London, The City’- “A conduit built by Henry le Waleys in 1282, and there was a standard for Thames water brought their by the contrivance of one Peter Morris, a Dutchman.” Besant also mentions several other conduits and a spring in the area of Cornhill, so it is not clear whether he is referring to the location of the pump. 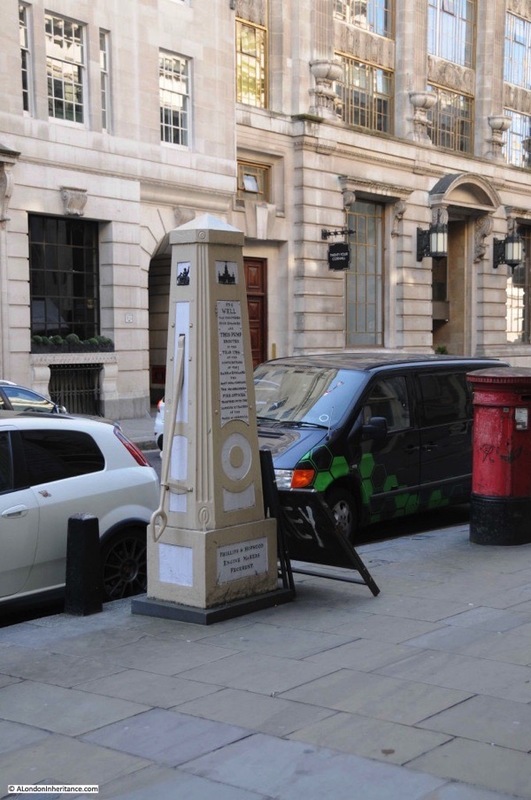 The well was covered and rediscovered in 1799 due to “a sinking of the pavement in front of the Royal Exchange, March 16, 1799″ according to ‘Springs, Streams and Spas of London’ by Alfred Foord in 1910. “The well and pump have been disused for some years past – the iron case of the pump remains, but deprived of handle and spout. The whole structure would be much better for a coat of paint, which would not only improve its appearance, but would also tend to arrest decay.” One hundred and five years later, Foord would be very pleased with the condition of the pump today. The course will be held at 5 Fournier St, Spitalfields on 7th & 8th November from 10am -5pm on Saturday and 11am-5pm on Sunday. Lunches cooked by Oliver Rowe and tea, coffee and cakes by the Townhouse. I loved these blogs and enjoyed every word and photo and I want to get on the very next bus to East Coker – I am booked onto the next course and am greatly inspired by what I have read this morning but also I have some trepidation – can I achieve a fraction of what these bloggers have achieved? Will I come anywhere near such a high benchmark? Somehow I think not but I am looking forward to trying! Reading of East Coker and evacuees reminds me of my own unique position: I am a Welshman, born in South Wales, who met evacuees from London but only in passing. My family evacuated me from South Wales to just south of London … and yes, we got bombed! Consequently I am now more Dell Boy than Max Boyce. I did return to live in Wales…. but … 75 years later! All the blogs look great. I guess I forgot the bit ‘that people will want to read’.